Before the Wakanda salute, before the album, there was a spark. Don’t look now, but Dipo’s charging up again. Go behind the scenes for the B/R POWER 50 Glow Up list. Victor Oladipo is a multidimensional star unlike many we have ever seen in the NBA. Last season, he became the first guard since Kobe Bryant in 2010-11 to earn first-team All-Defensive honors while averaging at least 20 points per game. But the Indiana Pacers guard has a flair for the spectacular that goes beyond stats on the court. Last October, he got 2 Chainz and Grammy winner Eric Bellinger to appear on his soul R&B album. Then, in February, at All-Star Weekend in Los Angeles, Oladipo used the dunk contest—and an assist from Black Panther's Chadwick Boseman—to become the NBA's king of Wakanda. Before he performed the Wakanda Forever salute, before he became a two-way sensation, Oladipo had to undergo a transformation. That happened last summer, when he stepped into the DBC Fitness facility in Miami's Design District, looked at DBC owner and director David Alexander and made a declaration. "Year 1, I want to be an All-Star," Oladipo said. "After that, MVP." These were lofty goals for anyone, let alone Oladipo, who had just come off a good but not stellar 2016-17 season. With the Oklahoma City Thunder, he averaged 15.9 points on 44 percent shooting and 1.2 steals. He played second fiddle to Russell Westbrook's MVP campaign and finished behind names like Jordan Clarkson and Patrick Beverley in 2017 All-Star voting for the Western Conference backcourt. He would need an all-out overhaul of his life, though. He was a bloated 221 pounds, and according to Alexander, he needed to transform his diet. No more white flour or gluten. No more candy or refined sugar. Hydrate with plenty of water (Oladipo began carrying around a jug everywhere he went and downing a gallon a day). "Victor was so inflamed," Alexander says. "He was putting in so much processed food and refined sugar and things that don't really fuel your body—your brain, your heart, your organs, your muscles. They're basically poison." Oladipo worked on both his nutrition and his biomechanics (his hips and back posture needed tweaking). He dropped 10 pounds in three weeks. He looked better, aesthetically and on the court, too. Then the Thunder dealt him to Indiana, along with Domantas Sabonis, for Paul George. "When he got traded, it really lit the fire," Alexander says of Oladipo. Indeed, Oladipo never looked back. He averaged 23.1 points per game and a league-leading 2.4 steals. He stole the show at All-Star weekend. In the first round of the playoffs, Oladipo gave LeBron James and the Cavaliers fits. He became the first Pacer ever to log a postseason triple-double with at least 25 points. He doesn't appear ready to slow down either. After a Game 7 loss in which he tallied 30 points and 12 rebounds, Oladipo texted Alexander that he was ready to get back to work. "When do we start? I'm ready to take it to another level," Oladipo messaged him. On May 20, Oladipo was back in the DBC gym, his eyes set on another transformation. All-Star, check. Black Panther, check. Next? MVP. "If you thought he was explosive last year, this year he's going to be f--king scary," Alexander says. "He's turning into a mini-LeBron." 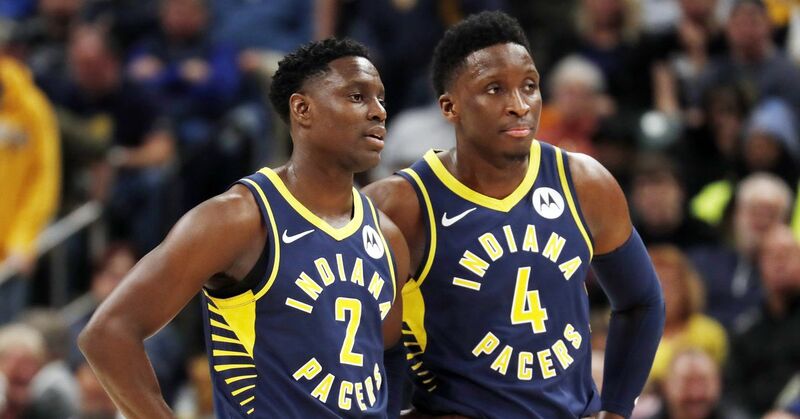 How Do the Pacers Get Oladipo Over the Hump?